nevard_120131_class22_IMG_2328, a photo by nevardmedia on Flickr. D6313 plods in to Combwich with a goods from Bridgwater, August 1964. Nearly all the photos of this class of loco show them in a right old state, even though they were fairly new. My depiction here, shortly after its initial weathering shows faded paintwork and a liberal coating of brake block dust. This is only the first stage, weathering for me taking 2 or 3 sessions, adding and removing the effect until I'm happy with the result, though probably more removal in this case. There is much standing back and appraising what's going on, the camera being a very useful tool in the process and far better at picking faults than the naked eye. nevard_120130_combwich_IMG_2324, a photo by nevardmedia on Flickr. Photo: 30587 departs Combwich with the 2pm service to Stogursey. ...but in the ethos of populist journalism for the masses, today I'm not going to let historical accuracy get in the way of a good yarn! Until 1955, a light railway served the small town of Stogursey up in the Quantocks. This railway was part of a grand scheme to link the port town of Combwich with Watchet, but sadly the railway company owned by Sir Henry Nythe of Nether Stowey ran out of money only halfway into the line's construction in 1901. The lightly built railway, whist it never got to the GWR at Watchet, served numerous stone quarries on route and supported the local agricultural industry to a lessor degree. Passenger traffic, as with most of these railways was very light, with the sharp curves necessitating the use of short wheel base locomotives and rolling stock. The ex-GWR coach here being the last outpost of this 4 wheeled design. 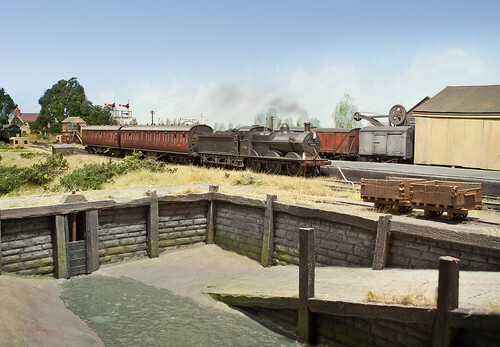 The Beattie Well Tank, whilst mainly known for their use on the Wenford Bridge line in Cornwall, were also used on the Stogursey line from 1952 to 1955, making this little known railway a popular destination for railway enthusiasts. For those readers living in the real Combwich and who keep emailing wanting more information about the railway, or to those living there who think that they know where the station used to be - the above is complete twaddle of course! For those who'd like to see a bigger version of the above photo, click HERE! nevard_120128_combwich_DSC_1272, a photo by nevardmedia on Flickr. Looking across a typical Somerset Levels rhyne, 43216 trundles in to Combwich with an afternoon goods from Evercreech Junction. August 1959. I enjoyed operating Combwich so much at last weekend's local show that I've set it all up in the guestroom for a week or so to simply play trains. OK, setting the layout up is nothing new, but I don't normally add the fiddle yard due to space, however the temporary repositioning of the spare bed within the room has allowed me to set up the layout in its full operational entirety at home for the first time in several years. So now the fiddle yard is full of stock allowing me to play trains in a proper fashion just like those rare occasions when the layout is on the road. Unlike at an exhibition, the control panel is now on the front of the layout which allows me to enjoys the punters' view. Above is not an angle I've tried before, but I think it works, hopefully capturing the feel of a summer's days looking across the North Somerset bog half a century or so ago. Photographically, it was just taken with a 10 second exposure under the single domestic ceiling light, the single point light source not doing a bad job at replicating midday sun. The top of the hand-painted backscene finishes just above the trees on the left and the signal to the right, so a little Photoshop was used to fill in the sky above and the cover up the magnolia painted bedroom walls. nevard_120125_class22_IMG_2312, a photo by nevardmedia on Flickr. Yesterday morning I opened the door to the porch to find this rather well packed parcel from Kernow Model Rail Centre sitting there in the form of the much awaited Dapol Class 22 - a very useful small loco, especially for those that model railways half a century ago anywhere west of Heathrow. I have yet to look at it properly, but was able to find a few moments to grab this snap of the compact little beast. Obviously the detail pack needs to be added along with separate panels that clip in below the body. I may well renumber this loco, though I know that there were many variations so I could be heading straight for a huge web of nit-pickers - even more than usual if I get that wrong with the number-obsessives. I did try collecting trains numbers once, it lasted for 1 about hour at Eastleigh station in the spring of 1981 before I got totally bored of what to me is a pointless activity - still, each to their own I guess! I have some good friends that collect loco numbers, so at least I now know that not everyone who does this is a nutter, but 30 mins at Tamworth Upper Level Station is enough to realise these good gentlemen are a rarity, but on the other hand, odd is interesting and cool - so, so what! The Class 22, or North British Type 2 Bo-Bo were mixed traffic locos, but lack of reliability meant that they tended to find work on less important services and were frequently seen on demolition trains on closed railways, where if they failed apart from the crew becoming marooned, were unlikely to mess up any schedule resulting in irate passengers! 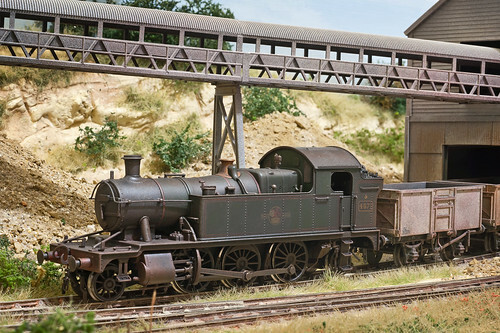 These locos in real life were pretty unreliable and generally unloved, so they mostly appear in photos looking more than a little worse for wear frequently with tatty worn paint - a weatherer's dream to recreate! For me it's a great choice, being ideal for the sort of backwaters I enjoy making, its compact size not over-powering the the small layouts. Whilst they only ever appeared on the SDJR after closure on demolition trains, one did briefly make an appearance at Glastonbury in 1964 on an inspection train - see this link. Something like that would make an interesting short train in miniature. Personally I can also see this loco being used on Cement Quay on the odd occasion I decide to back date the operation and of course it will fit in perfectly on Polbrock. All in all, a good buy! Well done Kernow and Dapol! nevard_120123_45xx_DSC_1208, a photo by nevardmedia on Flickr. 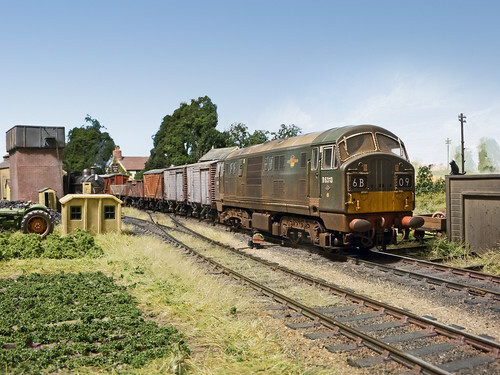 As mentioned in previous blog posts, the Astolat Model Railway Circle 2012 Expo in Guildford was to be Combwich's last outing for a while pending a total re-wire to take some of the lottery as to whether the layout will perform or not. Luckily, and much to my surprise the old girl, which has now turned 30, presented very few problems other than a dickie frog polarity switch under one of the run around crossover points. On the odd occasion it played up, a little kerfingerkerpoken under the baseboard adressed the issue with most viewers probably not noticing the workaround. Curiously, Combwich's baseboard alignment was the best it's been since the early 1980's, ever since then, despite the layout living in dry domestic atmosphere, the baseboard join which splits station area in half always leaves the most distant siding behind the goods shed with anything up to a 1mm drop at rail height when all other roads are in perfect alignment. This isn't really a problem, because it's more of less hidden from view and very few trains ever venture that far down the siding. My theory is that the environment at the Guildford show must similar to when the layout was orginally built; I always remember my parent's house being rather hot - actually it still is, and will no doubt get hotter as they get older which will be in harmony with the television getting louder! The photo above is of the latest newcomer, in the form of an ex-GWR 45xx. I've already blogged about this loco which will in due course be renumbered, but this photo shows the sort of landscape that suits it best. The Bridgwater service provided good reason for its inclusion on Saturday, with it really looking at home trundling in and out of Combwich with a B-Set or pick-up goods. The photo was taken with north facing natural window light, its low angle highlighting many the textures in the scene and soft warm colouring that I like to get into my model making. For photos of Combwich at the exhibition - click here. For a bigger version of the above photo - click here. Guilty Pleasure - Dabbing with the GWR! nevard_120121_45xx_DSC_1094, a photo by nevardmedia on Flickr. 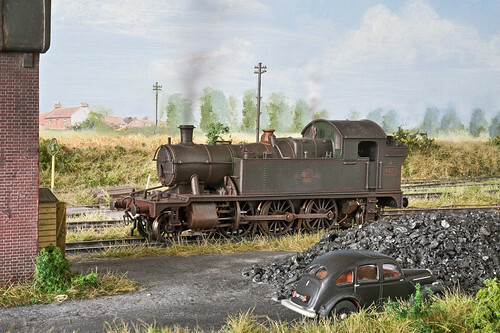 A Bachmann ex-GWR 45xx after an initial weathering captured pottering about on Cement Quay Old Quarry Wharf. In due course it will be renumbered with etched plates once I have finally decided on a suitable number, which will probably a loco from Taunton Shed(?). I'll be honest to knowing very little about the GWR other than it was the arch enemy of the S&DJR and Southern Railway, but their hansom locos do have a certain charm even if is potentially dabbing with the dark side. 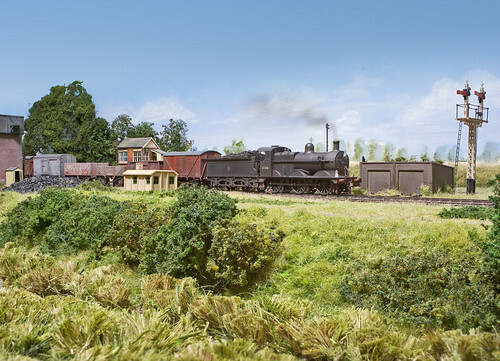 In my imaginary world, Combwich also had a service to Bridgwater, not to connect with the S&DJR at Bridgwater North, but with the GWR. For this service ex-Great Western motive power and trains were used, most usually a Pannier Tank or a 2-6-2 tank like this one on a B-Set. As a guilty pleasure earlier this evening I started weathering up this delightful Bachmann offering for the weekend show, and whilst it won't have the etched number plates in time, it now blends in a little better with the rest of the trains. 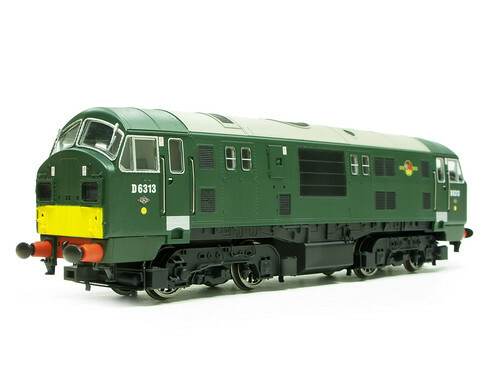 It's also a really steady runner, something that is always a bonus on a shunting plank. nevard_120119_combwich_DSC_1024, a photo by nevardmedia on Flickr. This afternoon, Combwich was assembled for an up and under prior to this weekend's show in Guildford. Much to my surprise, it ran pretty well first off, apart from a slight problem with a Peco polarity switch being a tad lazy - next job will be to dismantle the layout and ship it down to the show which is just a couple of miles away. Fingers crossed it will behave itself upon reassembly. We shall see! The layout has for the last few months been stored vertically with the boards facing each other. I thought I'd stopped the cats getting in, but one of them has obviously managed to get inside, and in trying to escape pulled some of the Silfor grass matting adrift, a little PVA sorted that out. Luckily none of the buildings were damaged by the little darlings. Here is a bigger version of the above photo. Combwich - on the road again, just one more time. nevard_101106_wycrail_IMG_8340_web, a photo by nevardmedia on Flickr. Wycrail, 6 November 2010. Note the cast of 'Last of the Summer Wine' in the foreground. 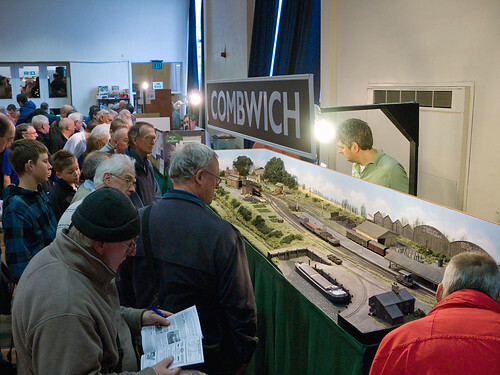 Combwich hits the road again on Saturday 21 January at the Astolat Model Railway Circle annual show in Guildford. Combwich is 30 years old now, and whilst the layout has been contantly updated to give the impression of being far more youthful than it appears, the wiring dates right back to the early 1980's and is very overdue for a full replacement. For this reason, the show will most likely be the layout's last outing for the time being until that gastly job takes place. Fingers crossed everything will hold out for this one day show, it's rather like running an old English sports car with Lucas electrics, TLC being the best tool in the bag. However, if you see a lack of activity and hear rude language from under the baseboard, that will be me cursing some failed solder joint or wire! More about the Astolat Show here. 8702_hurstbourne-via_50042_p, a photo by nevardmedia on Flickr. 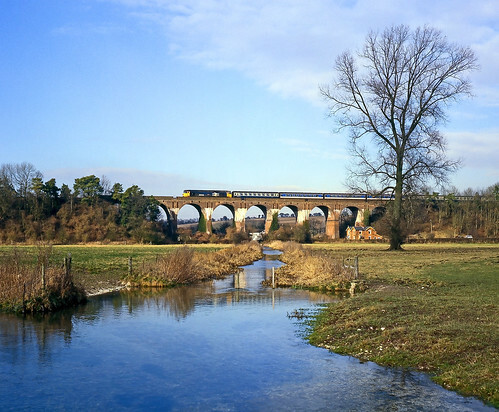 25 years on from this photo taken of 50042 running high across water meadows at Hurstbourne on lovely sunny day in February 1987, we can still enjoy a similar view without having to get up from our armchairs. Googe Street View is a great tool, but it's often not possible to capture an almost identical angle. 'The and now', apart from the train, the only other significant change is that the elegant tall tree has now fallen, and I suppose could have been a casualty of the 'Great Storm of 1987' which changed much of the UK landscape literally overnight - this photo being grabbed prior to that of course. Still comparing 'then and now', the water course looks more of less the same, albeit with less in the way of random old wooden posts. The pasture above would appear to have been nibbled, the same view now having alot more grass. This is probably just field rotation, suggesting that maybe the 1986/87 season it was used for animal grazing. A bigger version of the above snap here. 8405_barford_50020_p, a photo by nevardmedia on Flickr. 50020 powers through Barford St Martin a few miles west of Salisbury with a Waterloo bound service during a rather splendid April day in 1984. 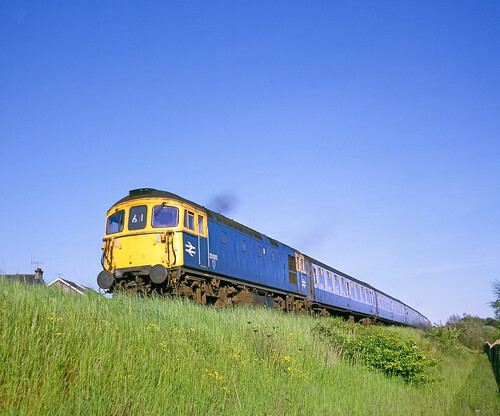 It's incredible just how the railways have changed over just a couple of decades, for back in the 1980's the majority of long distance trains were loco-hauled. 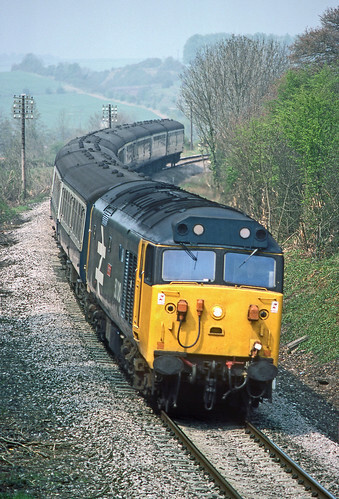 As a photography student in Salisbury during the mid-1980's, this meant that I was perfectly positioned to capture English Electric Class 50's on the Waterloo to Exeter service weather permitting. Luckily though, it is still possible to travel behind one of these powerful locos from time to time on the main line, albeit as stuffed tigers, but they do occasionally get hired out to TOCs for use on normal service trains from time to time. 8504_salisbury-mpd_33103_p, a photo by nevardmedia on Flickr. Pictures say far more than words here; just a quick note to say that I've just uploaded my Class 33 shots taken between 1981 and 88 to th URL below.